Misty Danielle Copeland, first African-American principal ballerina of the American Ballet Theater (ABT), one of the most prestigious companies of the United States, arrived in Cuba to conduct a visit until next Saturday, as part of the Program of Cultural and Sports Ambassadors of the State Department. Holding meetings with students and teachers, as well as touring institutions and historical sites committed to the teaching of dance and ballet are some of the actions that will be performed by the artist during these days, a key example of the determination that exists to foster relationships between the two peoples. 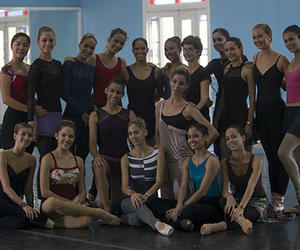 According to Cubarte, official site of the Cuban Culture Ministry, the program coordinated with local institutions includes visits to the headquarters of the National Ballet of Cuba, the Carlos Acosta Company and Lizt Alfonso Ballet. In these spaces she will appreciate the development of dance and the different programs that artistic education covers in Cuba, a specialization that has more than eight thousand students altogether. Misty Copeland figures as the first African American woman promoted to leading dancer in the history of the largest American ballet company. In addition to her dance career, Copeland has written two autobiographical books and her artistic career has stimulated the production of a documentary entitled "A Ballerina´s Tale", which reflects the professional challenges she has had to face.